Echuca developed as an important port from the early 1850s, when Henry Hopwood established a crossing place there. The Echuca Customs House was constructed in 1884 to administer customs regulations for the inter-colonial trade that were payable, until 1901, on goods imported to Victoria from the colonies of New South Wales and South Australia; this function dates back to late 1854, prior to the construction of the current building. It was one of only a small number of customs houses built on the Victorian side of the colonial border, and was the most important, situated as it was at the busy port of Echuca. The volume of trade at Echuca was greatly boosted after the arrival of a rail link to Melbourne in 1864. It was a site of competitive and often hostile relations between New South Wales and Victoria, and as such was as a key symbol of the economic need for the Federation of the Australian colonies, which had become critical by the 1890s. The Echuca Customs House was designed and constructed by the Public Works Department of Victoria. The working drawings for the building were executed by J.H. Harvey under the direction of G. Watson. It features the Public Works Department's distinctive use of polychrome-banded brickwork and round-arch windows with pointed hood mounds and incised keystones. The single-storey structure has a hipped roof clad in slates and surmounted by iron finials. The fine detailing, joinery and workmanship are particularly notable. The Echuca Customs House is of architectural and historical significance to the State of Victoria. The Echuca Customs House site is historically significant for its role in collecting customs duties on inter-colonial trade across the Murray River. The building's substantial size and prominent siting demonstrates the importance placed on customs collection by Victoria?s colonial government. The Echuca Customs House is architecturally significant for its Gothic-inspired form. 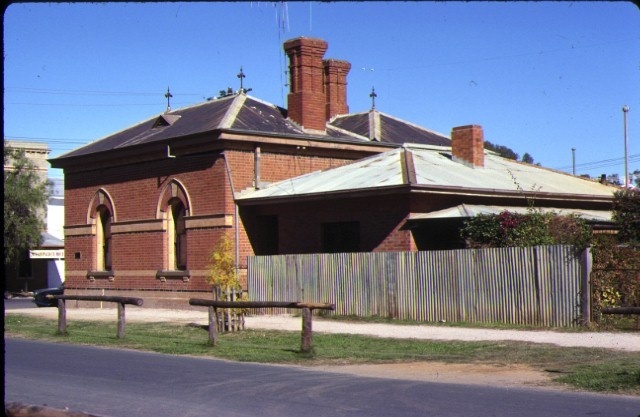 It is historically and architecturally significant as one of only two examples of customs houses on the Murray River known to survive in Victoria, and as a rare surviving example of a customs house designed and constructed by the Public Works Department of Victoria. The Echuca Customs House is also historically significant as a critical element of the historic Echuca wharf precinct; it has an important relationship with the other elements in the precinct, including the Echuca Wharf (1867) and adjacent Shackell's Bond Store (1859) [H558], which are amongst Echuca's oldest riverfront buildings. City of Echuca. No. 144. Former Customs House, Echuca, 2 Leslie Street, Echuca. This history was produced as part of an Online Data Upgrade Project October 2003. From the mid-1850s, the Australian colonies regularly imposed customs duties on goods imported into them from their fellow colonies. The imposition of these duties was a cause of much rivalry, dispute and ill feeling among the colonies and one of the principal barriers to their coming together into a federation. A series of customs agreements operated between the colonies from late 1854 until late 1873 when agreement between the two senior colonies, Victoria and New South Wales, broke down irretrievably. Thereafter, the two colonies systematically collected customs duties at a series of customs houses erected on either side of the Murray River border. The often antagonistic nature of customs collection along the Murray was exemplified in the rivalry between Echuca, in Victoria, and Moama, across the river in New South Wales. In the 1860s, the sub-collector of customs at Moama, Charles Gordon, was instructed by his government to assert the authority of his office with 'firmness and determination, with a strict regard to the provisions of the law.' This mandate was strongly supported by constables of the New South Wales Police. Echuca punt owner Henry Hopwood protested Gordon's heavy-handed demeanour by enlisting the help of the Victorian government, returning from Melbourne with six police officers under Inspector Hare, who had instructions to protect Victorian vessels from undue interference by New South Wales Inspectors. Ensuing events led to a tense armed standoff between the Victorian and New South Wales police. Although common sense prevailed, it was probably the closest two Australian colonies had ever come to armed conflict with each other. 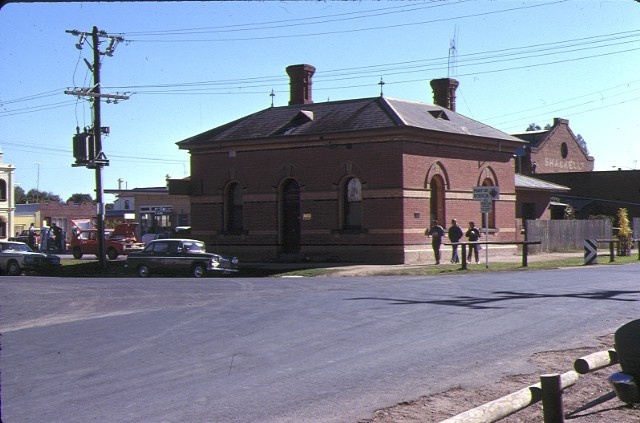 It is uncertain what facilities served customs collection in Echuca prior to the 1880s, although the building adjacent to the new customs house, Shackell's Bond Store (built 1859) may have been used. 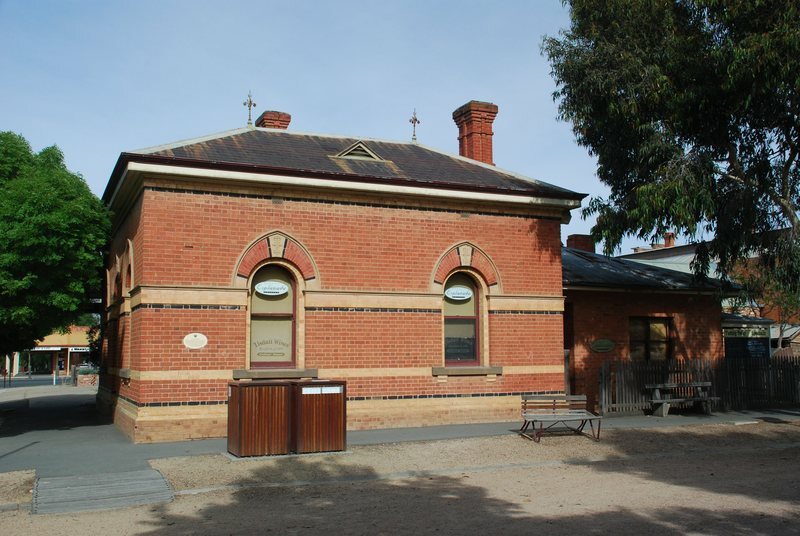 The Echuca Customs House was erected in 1884 by the Victorian Public Works Department. The working drawings were executed by J.H. Harvey under the direction of G. Watson. The ornate design, solid construction and money expended on erecting the Echuca Customs House stated the importance that the Victorian government attached to the collection of customs duties. As the building was clearly built to last, it suggests that at the time of its erection the Victorian government saw little prospect of a new customs agreement being reached with New South Wales. It was only when the colonies agreed at constitutional conventions in the 1890s that intercolonial customs would be abolished on creation of a federated nation that this major obstacle to federation was removed. When collection of intercolonial duties finally ended in 1901 with Federation, the people of Echuca and Moama celebrated. A military band from Echuca led a decorated wagon carrying six young girls, each representing one of the federating colonies. The procession, including dignitaries and prominent citizens travelled slowly across the bridge and met a similar delegation from Moama exactly halfway, symbolising the removal of formal barriers between the two towns. By 1930 the customs house had been sold to local accountant F. Lockwood, who used the premises as an office and lived at the rear. In 1983 the building was purchased by the Victorian Tourism Commission and it has been used since as a tourist information facility. Andrew Ward and Associates. ‘City of Echuca Heritage Conservation Study’. 1992.